After the huge success of world renowned Green Revolution in India that resulted in tremendous increase in production of rice and wheat, the India government took up “Operation Flood” Programme with a motive of increase in milk production and make India one of the largest producers of milk in the world. 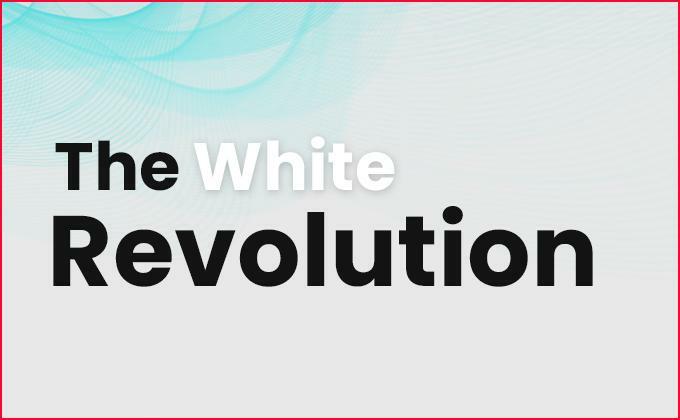 Indeed, this programme was a huge success and the entire world knows it as “The White Revolution”. Operation Flood was a rural development programme initiated by India's National Dairy Development Board (NDDB). This revolution started in the year 1970 following the Indian Green Revolution and was aimed to create a nationwide milk grid. It resulted in making India the largest producer of milk and milk products, and hence is called as the White Revolution of India. It also helped in reducing the malpractices by milk traders and mercenary merchants and ultimately helping in eradicating poverty. Operation Flood helped the dairy farmers, in directing their own development, by empowering them with the controls of the resources that they create. A 'National Milk Grid' was formed that connected milk producers throughout the country along with the consumers of more than 700 towns and cities. This helped in reducing seasonal and regional price variations ensuring consume satisfaction and at the same time ensuring that the producers get a major share of the price that consumers pay. "Anand Milk Union Limited", popularly known as Amul- a Gujarat-based co-operation was the engine that drove the success of the programme. At the time when the programme was implemented Verghese Kurien was the chairman of NDDB. He pushed forward the co-operatives with his sheer professional management skills, and is considered the architect of India's 'White Revolution'. There were several other big Co-operatives that empowered that transformed Operation Flood into White Revolution. Phase I was spread over a span of 10 yrs, starting from 1970 to 1980. It was financed by the sale of skimmed milk powder and butter oil which were donated by the European Union through the World Food Programme. NDDB planned the programme- “Operation Flood” and linked 18 premier Indian milksheds with consumers in India's major metropolitan cities, thus establishing mother dairies in 4 metros. In the initial stage of Phase I in 1970 certain well defined aims were kept in view for the successful implementation of the programme. Improvement of milk marketing in the organized dairy sector in the metropolitan cities- Mumbai, Kolkata, Chennai and Delhi was one such step to accomplish the goals. Starting from 1981, the Phase II of Operation Flood lasted till 1985. It increased the number of milksheds from 18 to 136. It was attributed to the fact that milk outlets were expanded to 290 urban markets. By the end of second phase, a self-sustaining system was set up that included 43,000 village cooperatives along with 4,250,000 milk producers. Domestic milk powder production also increased from 22,000 tons in the year 1980 to 140,000 tons by 1989. All of the increase in production was solely due to the dairies set up under Operation Flood. Ultimately, direct marketing of milk by these cooperatives increased by several million liters a day. Phase III of Operation Flood from 1985 to1996 gave a finishing touch to the programme by enabling dairy cooperatives to expand. This phase saw the strengthening of infrastructure required to market the increasing volumes of milk. Operation Flood's final phase strengthened India's dairy cooperative movement, by adding 30,000 new dairy cooperatives to the already existing 42,000 societies. Number of milksheds peaked to 173 and also the number of women members and Women's Dairy Cooperative Societies increased significantly. Towards the end of Operation Flood Programme 73,930 dairy cooperatives had set up linking more than 3.5 crore dairy farmer members. Due to the innovative strategies and sheer management skills adopted by these dairy cooperatives under the leadership of Dr. Kurien, the milk production peaked to an estimated level of 710 lakh tones. At present there are several hundred Co-operatives in India that are working very efficiently. Many such co-operatives were also set up by Verka Milk Plant, situated at Ludhiana in Punjab state of India. Now its subsidiary has also set up in Canada. Verka has played a significant role in White Revolution. In 1972 Verka started with 1 Lac. Liter milk per day and today it provides 4 Lac. Liter milk per day. It set up co-operatives on the “Anand Pattern” and today is one of the biggest chains of Co-operatives. Another such brand is “Parag” of Pradeshik Cooperative Dairy Federation Limited (UP). It has a total of 30 cooperative unions and 16 Dairy plants. It produces 1,680 thousand liters of milk per day. Serving the country, it produces a wide variety of milk products such as Cheese, Ghee, White Butter, Table Butter, Skim Milk Powder, and Milk Cake. “Saras” is another such brand name that comes to the mind while talking about White Revolution. It is a brand of Rajasthan Cooperative Dairy Federation Limited. It has 16 cooperative unions and 15 Dairy Plants. It is serving the nation while producing 1,425 thousand litres of milk every day. It produces a wide variety of milk products ranging from Pure Ghee to Sweets and even Ice Creams. Despite the huge success of White Revolution there are some critics on the other node who argue that the emphasis on foreign cow breeds has led to the decimation of Indian breeds. Albeit foreign breeds give higher yields, but they also require more feed and are not suited to Indian conditions. Critics further argue that operation flood came at the expense of development, research, and extension work in other areas of Indian agriculture. They also say that although the White Revolution has benefited the rural India considerably, yet it can not be sustained beyond a threshold limit due of the lack of purchasing power of the poor Indians, and the export front of India is bleak. Indeed, the White Revolution has played an important role in improving the living standards of the rural people in India. There is no doubt that the co-operatives, which were set up to accomplish the goals of “Operation Flood” programme, had also played a major role in the progress of the rural economy. There is no exaggeration in saying that White Revolution is the cause of prosperity in many of the Indian villages.